It is with regret that we post another tribute to a recently deceased New Testament scholar, Helmut Heinrich Karl Ernst Koester, better known as simply Helmut Koester, who passed away at the beginning of the New Year (see the notice from his church) at the age of 89 years. He was the John H. Morison Research Professor of Divinity and Winn Research Professor of Ecclesiastical History at Harvard Divinity School. Koester was born on December 18, 1926 in Hamburg, Germany, and received his doctorate at the University of Marburg under Rudolf Bultmann. He was apparently Bultmann’s last doctoral student. His first academic position was at the University of Heidelberg under Günther Bornkamm from 1954-56, and he then taught at Harvard from 1958, where he continued to teach until the fall of 2014. He is most known for writing and publishing on the areas of New Testament interpretation, history of early Christianity, and archaeology of the early Christian period. He was also apparently a POW during the Second War. His publications include Synoptische Überlieferung bei den Apostolischen Vätern (TU 65.5, 10; Berlin: Akademie-Verlag, 1957); co-author with James M. Robinson, Trajectories Through Early Christianity (Philadelphia: Fortress, 1971); Ancient Christian Gospels (London: SCM, Philadelphia: Trinity Press International, 1990); History, Culture, and Religion of the Hellenistic Age (vol. 1 of Introduction to the New Testament; 2nd ed. ; New York, Berlin: Walter de Gruyter, 1995 [1st ed. 1982]); History and Literature of Early Christianity (vol. 2 of Introduction to the New Testament; 2nd ed. ; New York, Berlin: Walter de Gruyter, 2000 [1st ed. 1982]); The Cities of Paul: Images and Interpretations From the Harvard Archaeology Project (CD-ROM, Minneapolis: Fortress, 2004); Paul and His World: Interpreting the New Testament in Its Context (Minneapolis: Fortress, 2007); and From Jesus to the Gospels (Minneapolis: Fortress, 2007). He also edited several books on the archaeology of New Testament sites. His other activities include the following: from 1975 to 1999 he was editor of Harvard Theological Review, and he has been co-editor and chair of the New Testament editorial board of “Hermeneia: A Critical and Historical Commentary on the Bible,” published by Fortress Press (Minneapolis). He was also an ordained minister of the Lutheran Church, a Fellow of the American Academy of Arts and Sciences, a member of the Society of Biblical Literature (president 1991), and of the Societas Novi Testamenti Studiorum. Needless to say his influence in biblical studies was far-reaching. Koester is most notable to the contributors of this blog because of his interest in the origins of the Gospels, a project that we have been working on for the past couple of years, and for his interpretation of the origins of early Christianity. Koester’s dissertation, Synoptische Überlieferung bei den Apostolischen Vätern (Synoptic Tradition in the Apostolic Fathers), argued that the material in the Apostolic Fathers (and pseudipegraphal works) did not need to be directly connected to the written Gospels, since at the time, some sort of oral tradition was still the predominant means of transmitting the life and teaching of Jesus. Although we do not directly argue for his position, his emphasis on some sort of oral tradition is one that should be given much more thought than it has so far. In his exploration of the Gospels, Koester wished to bring the apocryphal gospels fully into the discussion. As a result, he saw the Gospel of Thomas as containing tradition that is earlier than that in the Synoptics, and supported the independence of P.Egerton 2 from the Synoptics. These conclusions are less tenable than some of his others. Concerning the origins of early Christianity, Koester tended to follow views of pseudepigraphal authorship and late dates, views that sit comfortably within his German background and education. 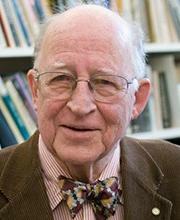 I (Stan) remember first seeing Professor Koester at an SNTS meeting in the early 1990s. The particular session was discussing a paper on early Christian inscriptions from Rome, a topic not frequently discussed at the time but one of great interest to Koester. There was a very free and open discussion of both large-scale issues and several different matters of small detail. It became clear in the session that many of the other scholars deferred to Koester’s opinions on these issues. This entry was posted in biblical scholars and tagged apocryphal gospels, harvard divinity school, helmut koester, koester death, new history of religions. Bookmark the permalink.